The Problem: Some cavities don't stop with SDF. Treatment of tooth decay with Silver Diamine Fluoride (SDF) is revolutionizing dentistry. The opportunity to use SDF as-is results in 70-90% of carious lesions (cavities) stopping. The ease of reaching this level of success is astounding, but millions of cavities keep growing after SDF treatment. We cannot leave them behind. Together we can do even better. 1. Why do 10-30% of cavities continue to grow? 2. How can we improve SDF to stop more cavities? 3. What is the optimal use of SDF? 4. Where can we use SDF to improve operative dentistry? Our Ask: We need bridge support. Any amount is welcome. Our last round of grants almost got funded. The NIH has invested $9.8M in the pivotal trial that will decide whether SDF gets approved as the first drug to treat caries. While they have supported our development, they have yet to support a basic science grant to improve on this 50 year old treatment. We believe the explosive popularity of SDF will now enable us to be the first to acquire public funding to improve SDF. We have prepared for this by generating tons of pilot data with dental samples from around the nation. We now invite you to join in driving scientific progress. We have been highly successful in obtaining collaborative resource grants to conduct focused groundbreaking work on cavity treatments. We employ methods found at some of the world's most advanced laboratories. Our mainstays have been the Advanced Light Source and UBiome. Collaborations are bounding forward with the Chan-Zuckerberg BioHub, Indian Health Service, Advantage Dental , and Williamette Dental. We have the materials and access we need. We seek donations to support our modest researcher salaries to keep us working on the problems listed above until the NIH cycle I project start date of September. We are basic and clinical scientists at UCSF devoted to advancing technologies to reduce the burden of dental caries throughout the population. Jeremy Horst DDS, PhD is a pediatric dentist, computational biologist, and microbiologist. Jong Seto PhD is a materials physicist and biomineralization expert. We have garnered significant interest, including a recent feature on PBS News Hour. The explosion of excitement following our protocol led to a nation-wide tour to educate dental personnel on this surprising new topic. Insightful conversations with thousands of thoughtful, hard-working dentists led us to the research questions we tirelessly work on every day. We are currently investigating the mechanisms of SDF successful arrest and refractory growth (continued growth of cavities), using cutting-edge microbiological and physical imaging techniques. We have found, to our surprise, that SDF casts silver nanowires in situ in carious dentin, reinforcing the weakened structure like rebar in cement (Figure 1 below). 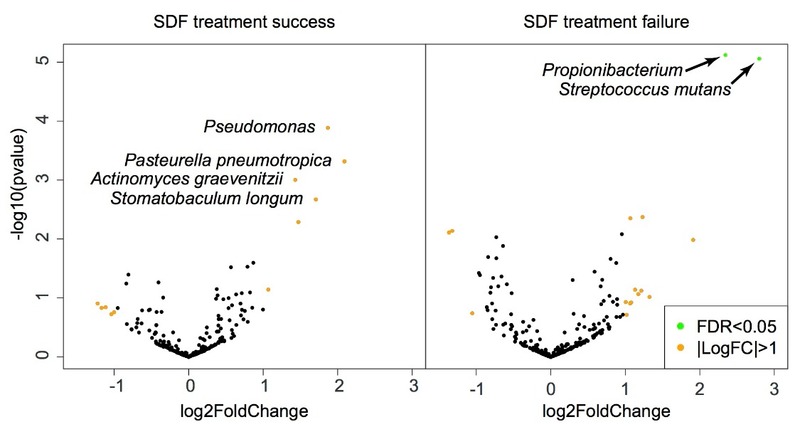 We also found that while SDF dramatically reduces the abundance of dental plaque, the cavity microbiome does not change (Figure 2). However, when cavities keep growing, Strep. mutans and Propionibacteria prevail (Figure 3). Our ongoing studies examine the basis of these observations. We are exploring ways to exploit these features to improve treatment outcomes. Particularly we are following up on the clinical relevance of variations in the nanowires, and SDF-resistance in dental plaque bacteria (Figure 4). A surprising pattern emerges from the few topical medicines that successfully prevent or treat dental caries: a preponderance of metal and halide ions. We will enumerate the combinations of safe and inexpensive metal-halide combinations and test for effects on dental plaque bacteria and carious dentin (Figure 5). 2015. Fresh Approach To Caries Arrest in Adults, in: Decisions in Dentistry. 2016. UCSF Protocol for Caries Arrest Using Silver Diamine Fluoride: Rationale, Indications, and Consent, in: Journal of the California Dental Association. 2016. Silver Diamine Fluoride Use in Older Adults, in: Decisions in Dentistry. 2016. Caries Arrest with Silver Diamine Fluoride, in: Decisions in Dentistry. 2018. Silver Fluoride as a Treatment for Dental Caries , in: Advances in Dental Research. Look for the California Dental Association Journal, and the Dental Clinics of North America releases this year! 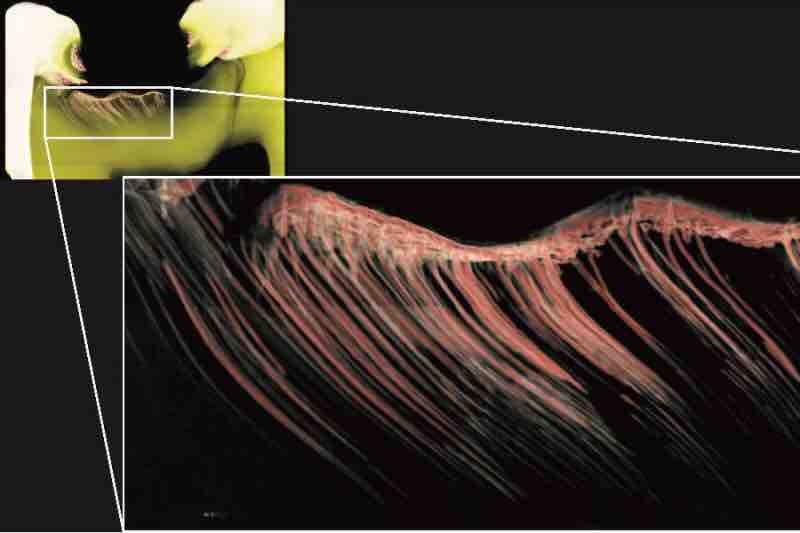 What if the patient could see a black stain appear when recurrent caries started at the margin of an old restoration? What if that stain were also treating the caries recurrence? We are working on an SDF-based material to do just that. ... and of course, you guessed it: What if SDF didn't stain? We're working on that too. We'll keep you posted. Figure 1. SDF induces solid silver structures in tooth dentin weakened by the caries process. 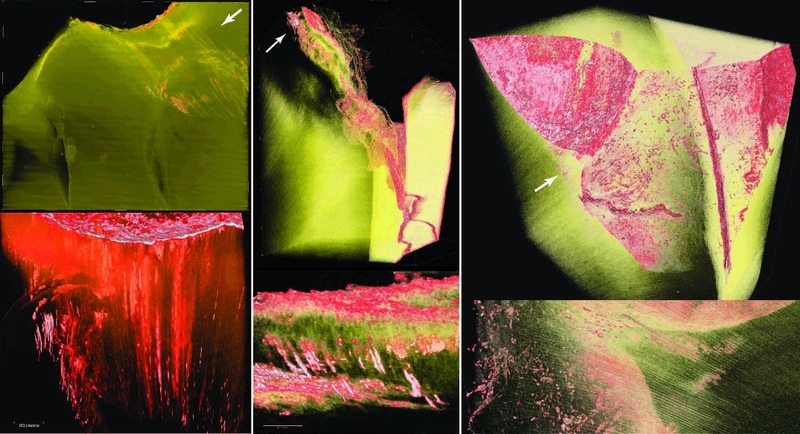 Sychrotron micro-CT images of SDF-treated cavities. Silver-based solid structures in red and white. See cover image as well. This work was performed on teeth contributed from patients of Drs. Cate Quas, John Frachella, Steve Duffin , and Jeremy Horst , at the Advanced Light Source 's Beamline 8.3.2 . Figure 2. Changes in microbes following SDF treatment. Species are plotted on the horizontal axis by the change in relative abundance following treatment in the SDF treatment group, relative to the placebo group. The horizontal axis plots the statistical significance of the change. Labels for species are shown when the estimated false discovery rate is <0.01 after adjusting for multiple testing. FDR: false discovery rate; FC: fold change; Δ: change; SDF: silver diamine fluoride. This work was done in the UCSF DeRisi Lab, in collaboration with the clinical trial run by the NorthWest Center to Reduce Oral Health Disparities, Advantage Dental, and was published this month . Figure 3. Differences in microbes following silver fluoride treatment induced arrest (success) or refractory growth (failure). Plotted as in Figure 2, as the difference in relative abundance between children whose cavities all stopped following silver fluoride treatment (left), or for whom some cavities kept growing (right). These groups were compared to each other, and children who had not been treated. Two bacterial groups stand out in the refractory group, and may be responsible for persistent refractory growth. This work was done with UBiome, studying samples from a humanitarian demonstration project from Dr. Steve Duffin and Paramount Chief Nene Abram Kabu Akuaku III for the children of Ghana. Figure 4. 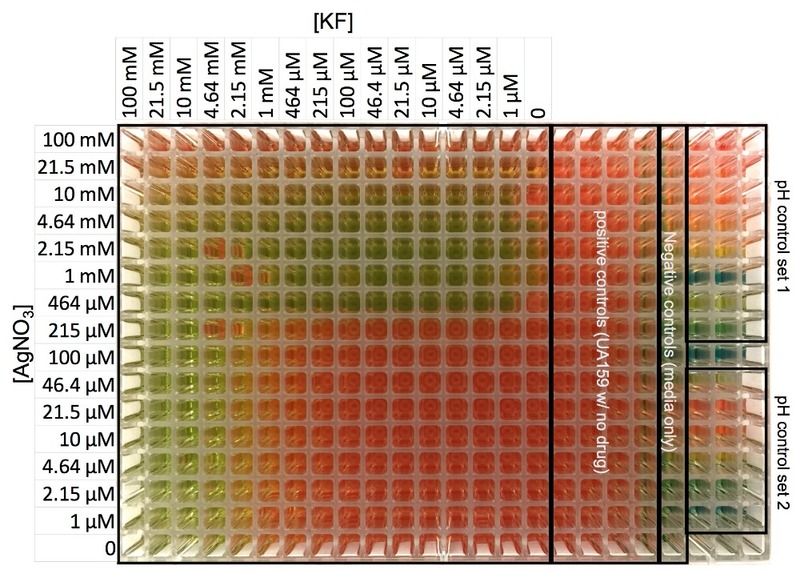 Clinical isolates of S. mutans show differing sensitivities to silver and fluoride. We are studying the relationship of silver and fluoride in inhibition growth of S. mutans that we isolated from cavities that arrested or continued to grow after SDF treatment. This figure shows growth patterns for 76 isolates. Figure 5. Colorimetric assay for growth and acid production by S. mutans treated with varying combinations of silver and fluoride. This work was performed in the UCSF Center for Advanced Technology with the new Echo LabCyte 555. We've been working hard on multiple NIH grant applications for the February 12th deadline. After multiple rounds of feedback from our mentors and collaborators, we just took a breath to update this page. If any of you want to see the process as it unfolds, and even give some suggestions, contact us!